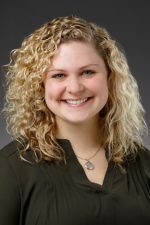 Kirby Curby-Warner, CNM, APNP, joined the Department of Obstetrics and Gynecology in January, 2019. She received her Bachelors Degree in Human Development & Family Studies and Gender & Women Studies from UW-Madison in 2013. She went on to complete her Masters Degree in Nursing in 2015 from Marquette University. She became a Board Certified Nurse Midwife in the fall of 2018 and is licensed in the State of Wisconsin. Prior to joining the Medical College of Wisconsin and while she was receiving her Masters Degree, she was a Nurse for 3 years on the Labor and Delivery Unit in the Birth Center at Froedtert Hospital. Kirby’s practice involves caring for women from the time they arrive on the Labor and Delivery Unit until their care is complete. She provides holistic and academic competent care to women during labor, birth, and the immediate postpartum period. Outside of the hospital, she enjoys adventures in the great outdoors, alongside her husband and 2 dogs. She also loves spending time with her family, friends, and riding her 2 horses, Mickey and Alice. To schedule an appointment or to obtain more information, please call us.